THE SCOOP: By moving just three doors north, Trivelli’s Hoagies has grown ten sizes bigger. The 38-year old family-owned sub shop celebrated the momentous move with a huge grand re-opening bash in mid-March. It was a family affair. 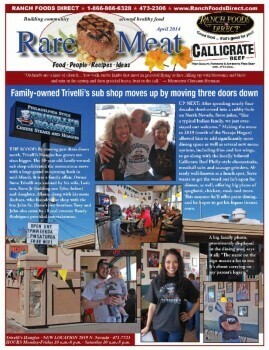 Owner Steve Trivelli was assisted by his wife, Lori; son, Steve Jr (holding son Tyler, in photo collage at right) and daughter, Allana, along with his mom Barbara, who founded the shop with the late John Sr. (Steve’s two brothers Tony and John also came by.) Local crooner Randy Rodriguez provided entertainment. UP NEXT: After spending nearly four decades shoehorned into a cubby-hole on North Nevada, Steve jokes, “like a typical Italian family, we just overstayed our welcome.” Making the move to 2819 (north of the Navajo Hogan) allowed him to add significantly more dining space as well as several new menu options, including fries and hot wings, to go along with the locally beloved Callicrate Beef Philly-style cheese steaks, meatball subs and sausage grinders. Already well-known as a lunch spot, Steve wants to get the word out he’s open for dinner, as well, offering big plates of spaghetti, chicken, steak and more. This summer he’ll offer patio dining, and he hopes to get his liquor license soon. A big family photo, prominently displayed in the dining area, says it all. “The name on the sign means a lot to me. It’s about carrying on my parent’s legacy,” Steve says. CLICK HERE to view the article and photo collage, shown above.